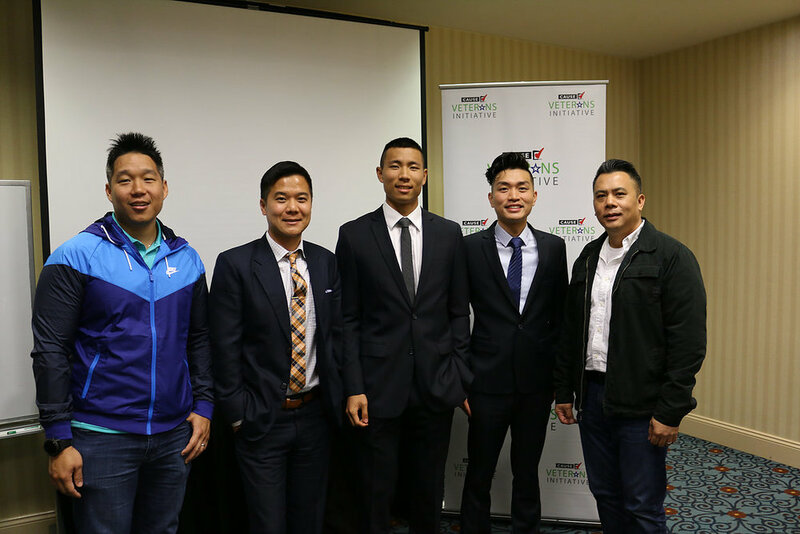 On May 7, 2016, CAUSE Veterans Initiative fellows, Henry Chan, Jonathan Kim, and Wen Lin, participated in their final Civic Leadership Session at the Pasadena Hilton. This session’s theme was “Advocating through Politics,” and was specifically designed to help fellows gain important insight on how to effectively advocate for the APA veteran community through political involvement. The session started with a policy and issue briefing on educational and employment related challenges facing veterans. The briefing was hosted by Everett Wong, Readjustment Counseling Therapist of the East Los Angeles Vet Center for the U.S. Department of Veterans Affairs, and Jeffery Chao, Assistant District Director, Veteran’s Employment and Training Services (VETS) at the U.S. Department of Labor. Both Wong and Chao are veterans and devote their careers in serving the veterans in navigating challenges they face in higher education and seeking employment. “The challenges facing APA veterans are not that unique comparing to our Caucasian, Latino or African American counterparts. However, APAs only comprise 3% of the military so it’s important for us to claim the benefits and opportunities that are offered to us,” shared Wong. “There are many ways to develop your career and help other veterans. You don’t have to choose between the two and government is a great place to start,” Chao encouraged. During lunch, fellows met with mentor Steven Ly, Councilmember for the City of Rosemead. Councilmember Ly shared how his military experience informed his political involvement and vice versa. Councilmember Ly acknowledged how impressed he was by Veterans Initiative fellows’ resolve to help other veterans and APAs in the community. “You are already off to a great start as you are already taking action to give back to the community,” Councilmember Ly praised. The session concluded with a community organizing skills development workshop hosted by CAUSE Executive Director, Kim Yamasaki. The fellows learned more about how to organize the community in preparation for their upcoming veterans resource fair.